Something very unpleasant happened to me today. I got struck with heat apoplexy. It wasn’t as serious as it sounds, but the truth is – I felt weakness for 2 -3 hours after I got back home in the late afternoon. I am OK now, but it was very foolish of me not to drink water… and wearing those skinny jeans and uncomfortable high platform sandals..
Back home I realized I did spend the hottest hours of the day driving in my car or at the brightest sun taking photos of some beautiful scenery. Amazing, I didn’t feel a thing at the time, but later on … I felt like jellyfish and barely managed to drink a few glasses of water and make myself some tea (and coffee – sorry I know it’s dehydrating but I can’t live without it). That’s what most weight loss diets recommend. Others, on the other hand, don’t pay much attention to water and emphasize more on eating healthy foods. I’m not sure if you realize that sometimes you can overeat because you are dehydrated. Yep, foods contain liquids, your body needs liquids – so overeating with healthy foods is not excluded, either. If you feel hungry – drink water and wait 5 minutes. If you are OK – no more food cravings then you’ve truly been thirsty. If you feel hungry – drink water and wait 5 minutes. If you still feel hunger then you should eat. Whether a juicy fruit, or some sort of a healthy meal – it depends on the diet plan you are on. Unfortunately today I did not drink enough water and didn’t have a juicy fruit at hand that is way I felt weakness and dehydrated for hours later. I know, I know – everyone knows those advices, even I do, but yet I disobeyed them today and suffered a few hours because of the sunstroke. I assume no details are needed here. 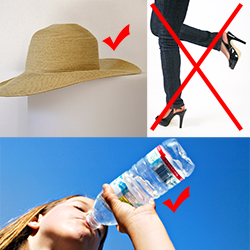 Do not ever wear uncomfortable shoes – because it’s worse enough already that you are hot, sweaty and thirsty, but to feel your feet sore is just too much. Don’t do like me today and you will bear smoothly and without troubles the remaining summer heat.